MPAC stands in the center of McKinney’s downtown square, overlooking a bustling arts scene. McKinney always offers a wide variety of arts and musical experiences, but August seems to be more chockful than ever! From community theater to a world-renowned rocker (hint: think Fleetwood Mac! ), there is no shortage of arts and music from which to partake in McKinney this month. The McKinney Repertory Theatre is keeping the stage at the McKinney Performing Arts Center busy this month with a couple shows. The first two weeks of the month feature a melodrama, “Return to Calamity Gulch” which encourages audience participation in the way of popcorn being thrown at the performers and much cheering and booing. Then later in the month (Aug. 17-19), the MRT’s Young Actors Guild takes over, bringing “Fox Tales” to the MPAC stage. Lindsey Buckingham (Fleetwood Mac) to rock the MPAC stage in a sold-out concert Aug. 22. 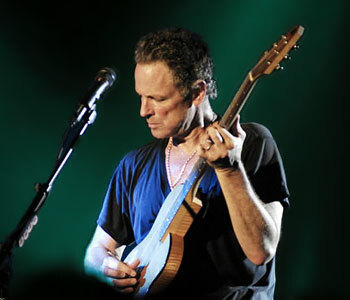 Rocking the MPAC stage on August 22 is Fleetwood Mac guitarist Lindsey Buckingham. Sorry, though, folks – if you don’t already have a ticket, you’re out of luck on this one. This show sold out last month. But those lucky fans who do have tickets are in for a treat! ENJOY! As always, McKinney’s downtown square comes alive for Second Saturday (August 11) when guests are invited to enjoy a fun filled evening of art, shopping, music, food and spirits. The local art galleries and even a few of the other businesses feature local and regional talents of artists and musicians. Of course, a trip downtown isn’t complete without eating in at least one of McKinney’s fine eateries. (Why not see how many you can visit by enjoying pre-dinner drinks and appetizers in one location, dinner in another, then stop for dessert somewhere else! All the while, there’ll be great music to set the mood for your evening. Also, quite a few shops in downtown McKinney will also keep their doors open for this monthly event. Garret Art Gallery is featuring watercolor artist Sarah Buie (from Aug. 11 through Sept. 6). At a young age, Sarah Buie enjoyed both drawing and painting. Sarah studied art history at the University of Dallas but painting remained her passion. Her style falls somewhere between Impressionism and Realism with an endeavor to express the good and the truth through everyday objects and nature. Her primary desire is to glorify God through her art by helping people see that despite the storm there can be peace, despite the sorrow there can be joy, and despite the struggle there is hope. Sarah works as art teacher and in-home caregiver in Grapevine. She continues to enjoy traveling and giving of her time and talents to people close to home and abroad. 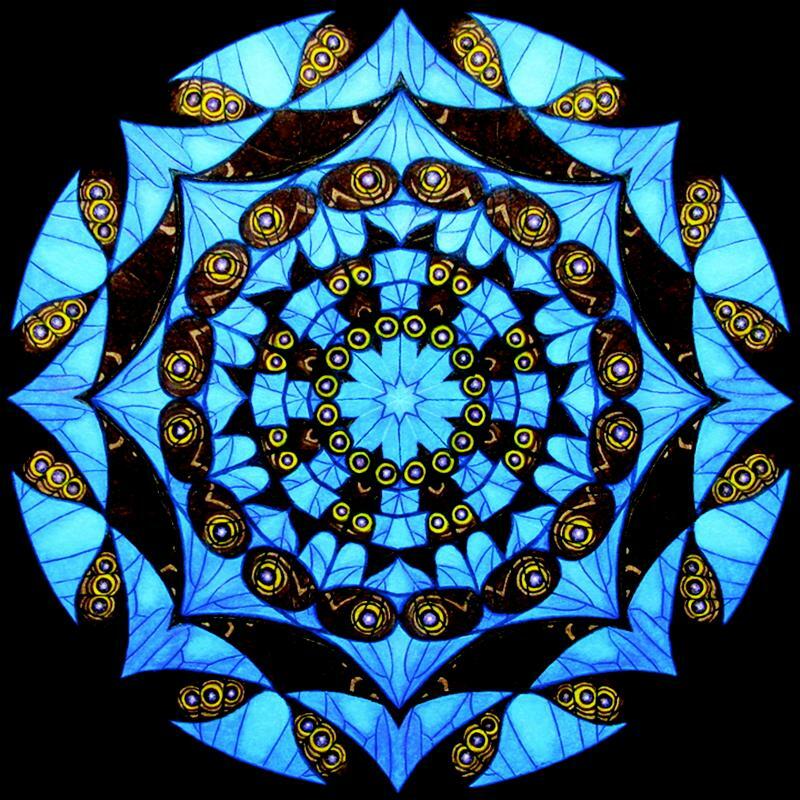 Stop by The Garret Art Gallery from 7-10 p.m. during Second Saturday to meet Sarah and see her art, while enjoying refreshments. Imaging on the Square is featuring various local artists, showcasing their many different mixes and mediums throughout the evening. They’ll also feature up-and-coming singer Stacey Whitson during the Second Saturday event. A sample of art in Laura Moore’s Hideout “open call to artists” juried art exhibit this month. It’s time for Laura Moore Fine Art Studios’ annual open “call to artists” juried art exhibition, this year themed “Hideout.” Guests can see more than 80 works of art from 45 artists in two locations through September 5 at two locations: the gallery itself at 107 S Tennessee, and hiding out in a second location at the Heard-Craig Carriage House at 205½ W. Hunt Street. There is always an eclectic mix of artists and mediums in this show, so do make a point of seeing it. You’ll be glad you did! Orisons Fine Art & Framing Gallery features the work of several professional photographers from the north Texas area who have been invited to show their work in a Group Photo Show. The public is invited to the gallery to view and vote for their favorite photograph leading up to the event. Voting patrons will be entered in a prize drawing for free print to canvas services. Photographers winning the People’s Choice Awards will be announced during the Second Saturday reception. And something even more special at Orisons: The gallery has acquired three extremely rare Bert Stern photos of Marilyn Monroe. Taken six weeks prior to her death, these are from Monroe’s final photo shoot commissioned in June 1962 by Vogue Magazine. All three were originally published in Stern’s 1982 book and are signed and numbered (each is 199/250) with certificates. The plates used to print these were donated to a museum and will never be printed from again. During the photo exhibit, these will be on display and for purchase. Vote for your favorite of these as well through August 10 to be entered in a drawing for a free 16 x 20 canvas wrap. 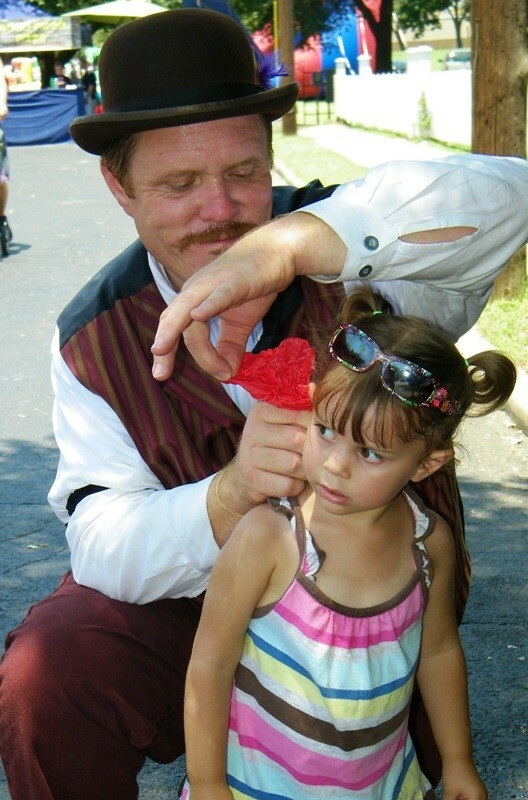 Main Street Magic & Fun Company’s Chris Gracy performing magic at this year’s Ice Cream Crank Off. McKinney Wine Merchant features the art of Nick Saia. 120 W. Virginia, 972-542-4636. Main Street Magic & Fun Company hosts their monthly Cabaret Style Magic Show at 7 p.m. (for adults & children) and again at 9 p.m. (for adults only) in their Magic Attic Theater. Tickets are only $10 and include a complimentary glass of wine for those 21 and older. Seating is very limited so call 214-274-7802 to reserve your tickets. The following is the live music you can enjoy during Second Saturday. The McKinney Convention & Visitors Bureau also lists all live music for the month on their Visit McKinney Texas Smartphone app. Click HERE to access a link to download the app for your iPhone, iPad or Android. Support Local High School Musicians! 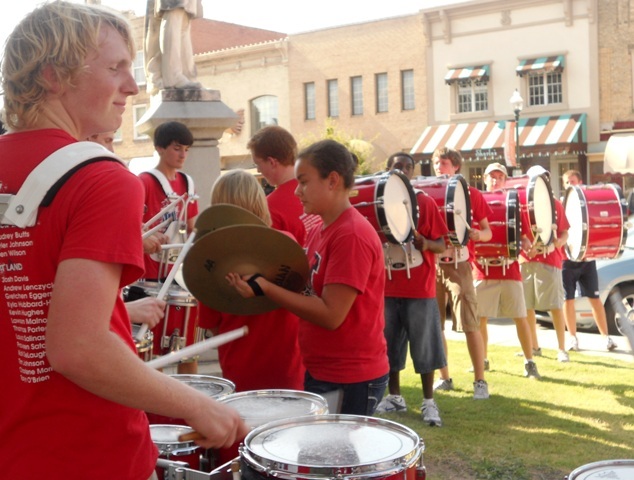 The McKinney Boyd Band drumline kicks off their Drum-a-thon on the downtown square.